60 pages. Softcover. Includes two sheets of Cardboard Heroes, a 12-page pullout section, and four ledger-sized maps. Choose Your Weapons . . .
and your armor, and your shield. You're ready to fight it out – Man to Man. Design your own fighter: sword-wielding barbarian or fencer, martial artist or archer. Attack, dodge, parry, block, and maneuver, just as you would on the battlefield or in the arena. If you survive, hone your skills for future combats – if you survive . 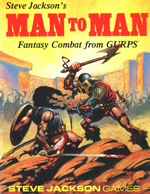 . .
Steve Jackson, designer of Car Wars, Ogre, and Illuminati, now brings you an exciting medieval combat system – the first release from GURPS, the Generic Universal RolePlaying System. 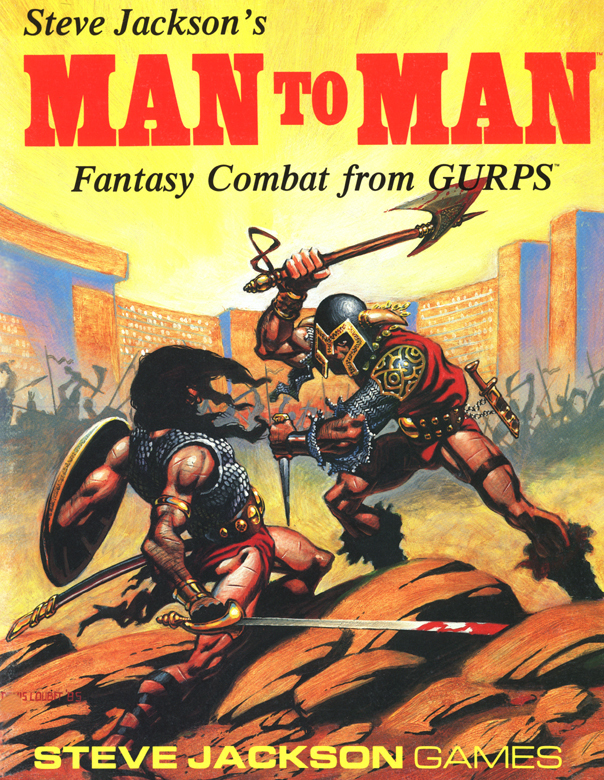 You can play Man to Man as a fast-moving boardgame, or use it as a combat module for any fantasy or medieval roleplaying adventure. Some elements of this set were originally printed on oversized paper, so the PDF version contains two formats: the original size, for those with access to oversize printers, and modified versions that span multiple regular sheets. GURPS Martial Arts – From popular Asian bare-handed techniques to European combat arts to fantastic non-human training, this book balances realistic historical schools with cinematic feats from Hong Kong, Tokyo, and Hollywood.